311's Nick Hexum On 'Mosaic,' Longevity And The Fans For one of rock's biggest cult bands, sticking together for 27 years has had its challenges, both musical and personal. But frontman Hexum says 311's just grateful to its famously loyal fans. 311 (from left: Chad Sexton, Nick Hexum, SA Martinez, Tim Mahoney and P-Nut) released its 12th studio album, Mosaic, earlier this year. You'd be forgiven if it's been a while since you thought about the band 311; it was the mid-1990s when the Omaha, Neb., quintet's biggest hits, like "Down" and "All Mixed Up," came out. But after 27 years of 311's hard-to-peg sound — a meld of rock, reggae, metal, funk, rap and ska — hordes of fans are as in love with the band as ever. Billboard recently called 311 "one of the biggest cult bands in America, whether you love or hate them." That's no exaggeration. 311 has its own Caribbean cruise, where fans can revel in a sea of fellow die-hards. It's got its own cannabis product, a vape pen aptly called the Grassroots Uplifter. And the band even has an unofficial holiday: Legions of devout followers celebrate March 11 (yes, that's 3/11) every two years by making a pilgrimage to a designated site for a special 311 concert that can go on for hours. The cover art of 311's new album, Mosaic, is made up of almost 10,000 photos of the band's fans. On 311's 12th studio album, Mosaic, those devoted fans are front-and-center — literally. 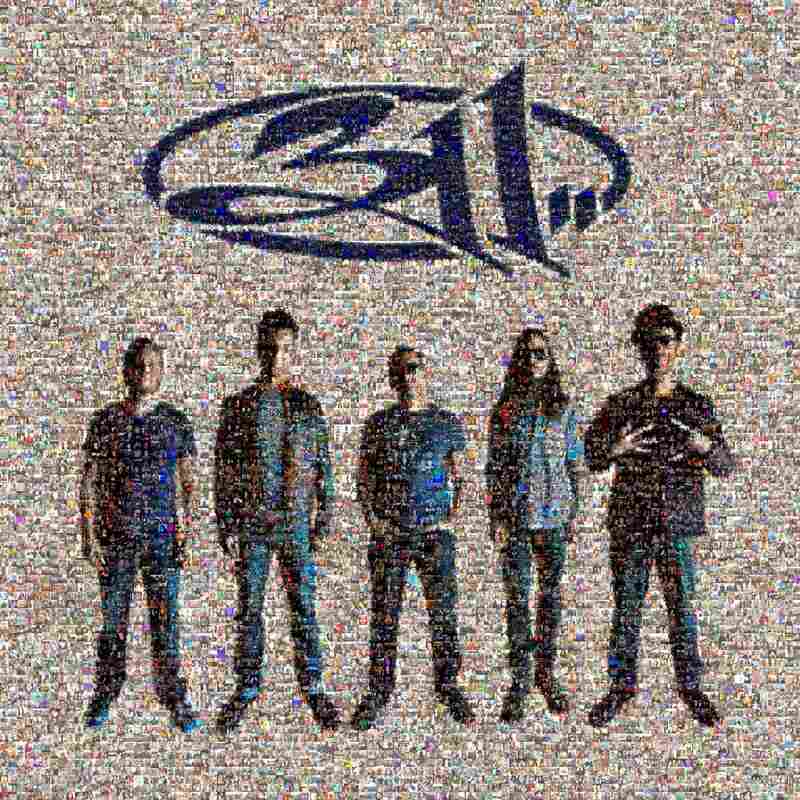 The album's cover art features an image of the band made up of close to 10,000 photos taken with and submitted by fans. Frontman Nick Hexum has said the cover and album title speak to the "collective nature" of 311 and "the bond between the band members and our fans." Hexum joined NPR for a conversation about navigating the challenges of longevity, the experimental attitude the band adopted in creating Mosaic and the positive message it's tried to spread over nearly three decades of making music. Hear the conversation at the audio link and read on for an edited transcript. Lakshmi Singh: Bands like Pearl Jam and Nirvana, whose music tapped into youth angst, helped define the 1990s — but your music seemed to sway in a different direction. Tell me about that. Nick Hexum: I addressed it on [the] "Blue Album" in a song called "Misdirected Hostility," where I just felt that I didn't really relate with all the anger. I felt it was a time of prosperity, and we didn't have the Soviets getting ready to blow us up like we did in the '80s ... And these were a lot of suburban kids that were pretty angry about something, and so we felt we were gonna be the antidote for that ... We see the glass as more than half full. And that's the seeds of what turned us into a bit of a cult band, because we had our own unique attitude, and people see it as a way of looking at the world, a lifestyle. How have the five of you in 311 — the same members for the better part of three decades — managed to stay together all this time? Well, you have to be ready to not get your way, and know that what the group conscience decides is gonna be the rule. We know that we're better together than we could ever be apart ... It's like a marriage, and you have to be willing to do things you don't exactly wanna do, and keep the egos in check. We were happy to find out the other day that we are the fourth-longest-running band of original members out today, with U2 being the first, Radiohead being the second, De La Soul being the third, and we're the fourth. So that's really cool company to be in. And I feel like, who knows, we could just be at the halfway point of our band. We always feel that success is measured in longevity and enjoying the process — how long can we get to do something we really love — instead of basing it on any sort of sales metric. You've said that there's always a risk of repeating yourself when you get to album 12. What did it take to keep that from happening on Mosaic? Really, it was just keeping an eye towards [the idea that] anything that was weird is good. Anything that is new, anything that is fresh — those are the ideas that we pursued. And also just mixing up the process: Instead of being in our own little bubble, we asked other people into the room with us to record. ... I think that's an exercise in remaining teachable and being humble — to realize that you can learn from others. And I think that's the biggest block that an artist of our age can have, is when you don't reach out, you don't keep mixing it up and bringing new people in, because your ego makes you feel like you can't accept help. Everything you've just told me makes me think of the track "Wildfire," which sounds a little different than the others. "Wildfire" was the first song written for Mosaic. ... I wanted something that started big and then had this real trip in the middle. And it goes through this sort of cinematic thing where there's even like beach sounds and waves and seagulls and stuff, because it represents what I'm talking about in the song — the calmness of knowing that you have people that will be there for you — singing about my family, singing about the band. So it's a very emotional song. And then it ends in a big guitar-shredding, almost classic-rock kind of thing, because at some point there's no words that can express, and you just need to express through music. ... I've had some fans on Twitter say, "You don't need to do epics, just keep it simple." But for me, that's where real creativity lies — to just let yourself go. You decided to end Mosaic with a song called "On A Roll." It seems to be an intimate message to fans — what are you telling them? It's about our longevity, it's a nod — to the fans — of gratitude. ... You know, the fact that we were able to have 10 top-10 albums [with] sporadic radio support, made us just feel really grateful. And this song, "On A Roll," it's kind of about that feeling of, like — we don't have to have anxiety because we have this support of the bandmates, of our fans, and you know, we're on a roll. Still, some fans have wondered if this is sort of a goodbye letter. Is this it for 311? No, I don't see that at all. I'm saying, on a roll, here we go, we keep going, this feels good, we've got momentum. I've said before that we could be at our halfway point of our career. And some people say, "Well, you don't wanna be rolling out there in wheelchairs," but who knows? We could still be a good band to see in wheelchairs — why not? All we know is that we're gonna do our best today, keep it going and take good care of what we've been so fortunate to find. Radio producer Dustin DeSoto and web editor Rachel Horn contributed to this story.